Experiences in Socorro are best described as majestic, surreal and graceful. 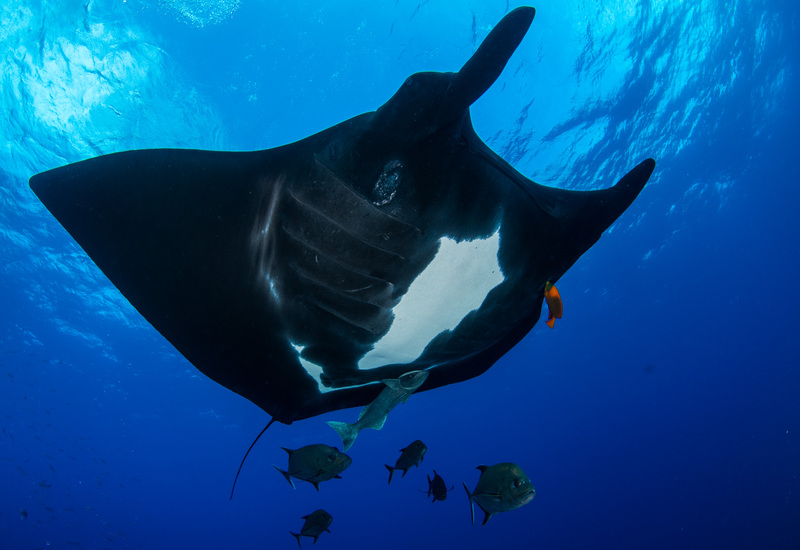 Socorro moved high on my bucket list after other divers described it as the “Galapagos of Mexico.” After hearing that super-friendly giant mantas and dolphins seek out interactions with divers, I thought sign me up! I was even more excited once I heard that whales, whale sharks and hammerhead sharks are in the area certain times of year. What makes Socorro so exhilarating? 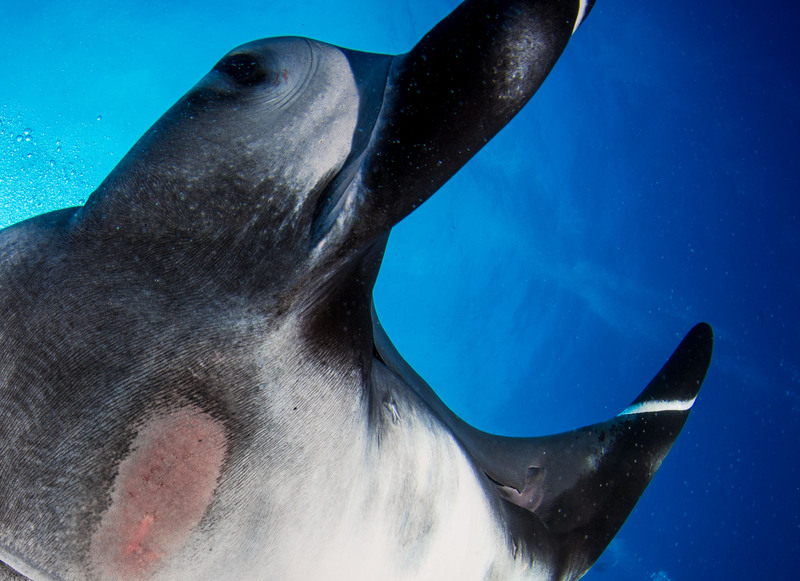 The mantas interact and seem to enjoy divers blowing bubbles on their bellies. In other parts of the world, they often disappear after a quick fly by. 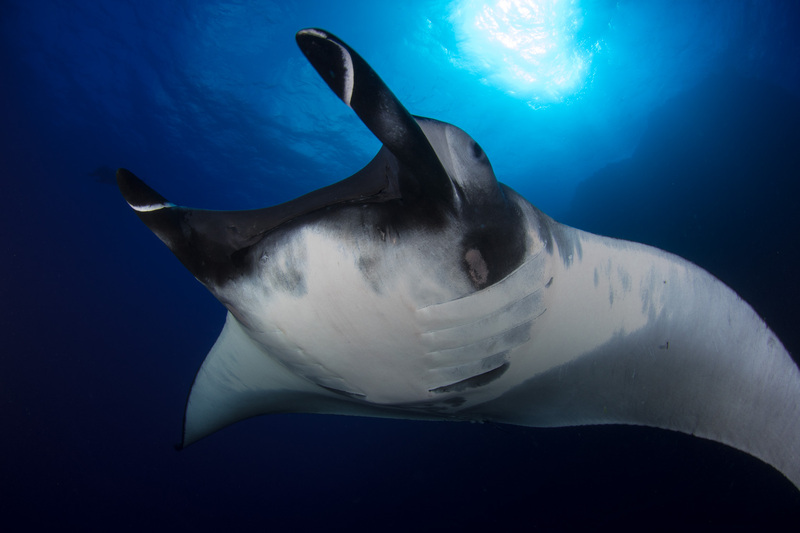 Some speculate there may be resident mantas in the Socorro area year-round – perhaps this contributes to their friendly behavior? 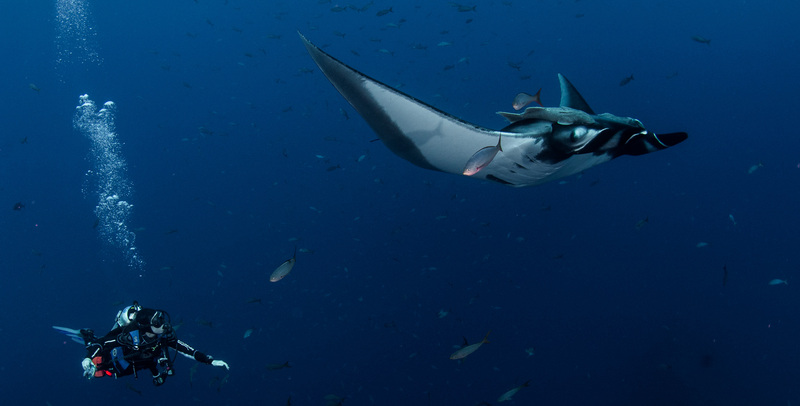 The mantas in Socorro are giant/oceanic mantas, with an average wingspan of 17-22 feet! 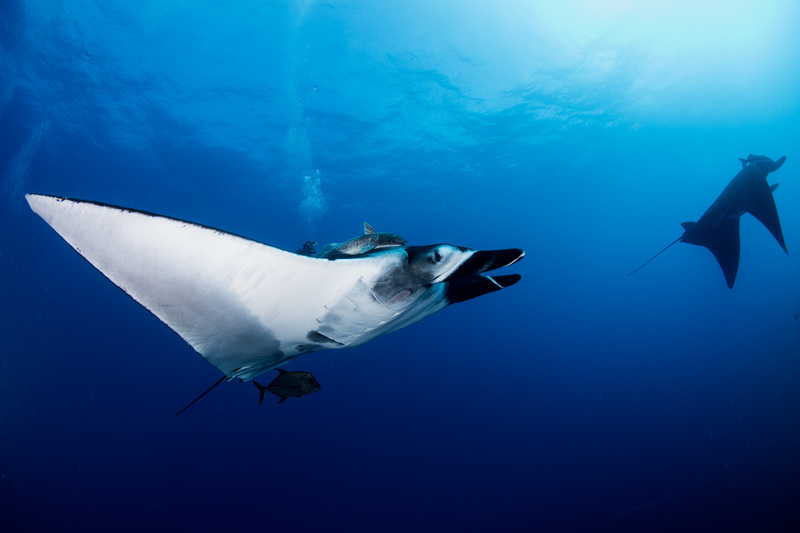 The reef mantas I’d seen before have an 11-foot wingspan. 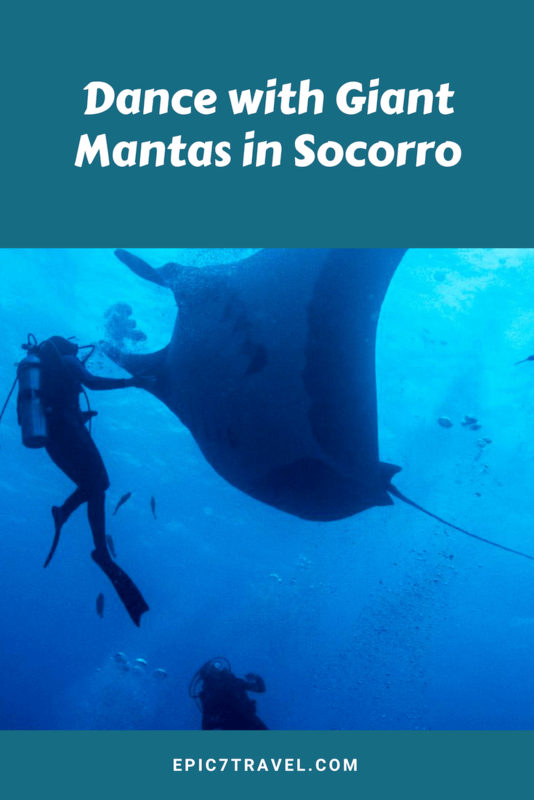 Socorro has the largest number of black mantas in the world and I’d NEVER seen one before. It’s mesmerizing to watch these stealth bombers approach. Many have asked me if I was afraid of getting stung. Absolutely not. It’s impossible since manta rays don’t have stingers (only stingrays do). Some have referenced the stingray that accidentally killed Steve Irwin. Sadly, his death was a freak accident and not something I’m fearful of with either mantas or stingrays. 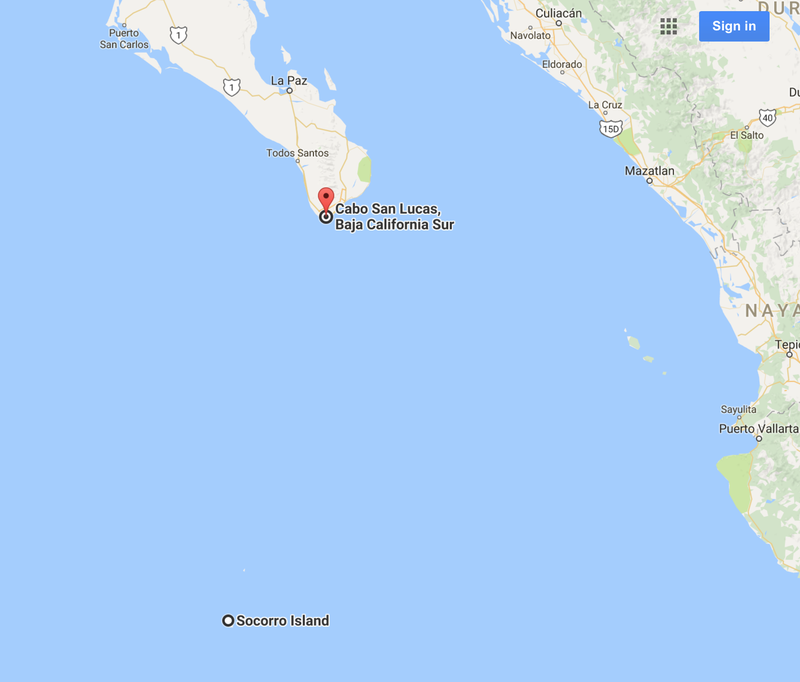 Although the official name of the island chain is the Revillagigedo Archipelago – which sounds as if I have a mouthful of marbles if I attempt to pronounce it – I’ll stick with Socorro. Where are the Socorro Islands? Located 250 miles southwest of Cabo San Lucas, Mexico, the Socorro Islands are an amazing, but obscure scuba diving destination. They were newly listed as a Unesco World Heritage site in July 2016. Accessible only by live-aboard dive boat, it’s a 24-hour ocean crossing to reach the islands. It’s often a VERY rocky ride where many succumb to seasickness. But, that’s what the Relief Band, Bonine, and the Scopolamine patch were invented for, right? Despite both my husband and me suffering from wretched seasickness and being unable to eat for most of the crossing, the hellish boat ride was absolutely worth it. 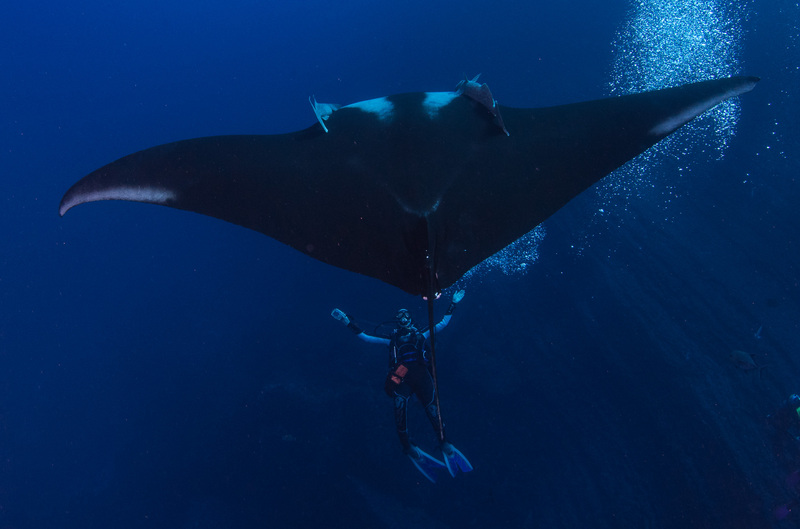 What’s it like to swim with giant mantas? 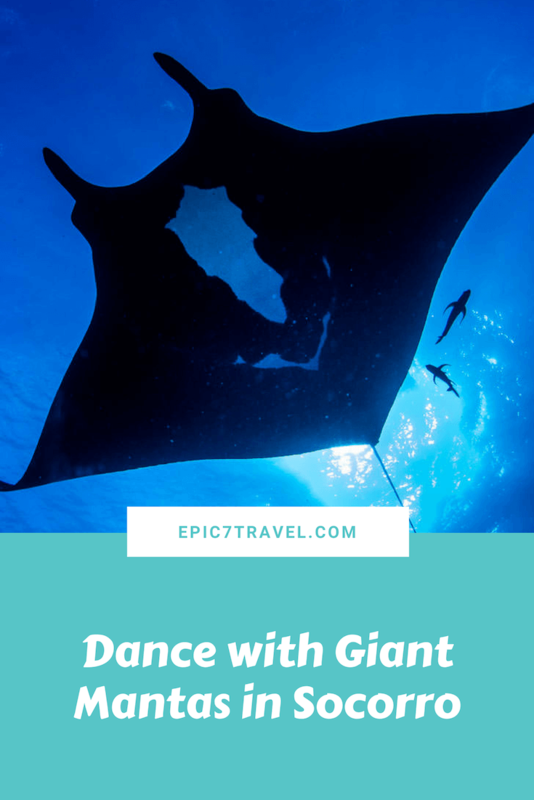 Imagine floating weightlessly underwater while giant mantas with 20 foot wingspans skim over your head, wiggling and shivering in delight as your exhaled bubbles tickle their bellies. So often, with wildlife experiences, it seems that we are the ones deriving enjoyment. Providing the mantas with as much joy as they were giving me was an experience of a lifetime. This symbiotic interaction ranks as one of my MOST memorable and amazing wildlife interactions in the world. Based on the other divers’ perma-grins when we surfaced, we all felt the same. Swimming alongside these majestic creatures and looking them in the eye as they gracefully drifted through the water was captivating. We all respected the instruction to not chase or touch the mantas and let them come to you. Fortunately for us, the mantas didn’t have the same rules; they repeatedly did fly-bys at the Boiler dive site at San Benedicto Island. Interestingly, one of our dive masters, Rodolfo, blew a significant bubble stream onto a manta’s belly with his octopus (back-up air source). 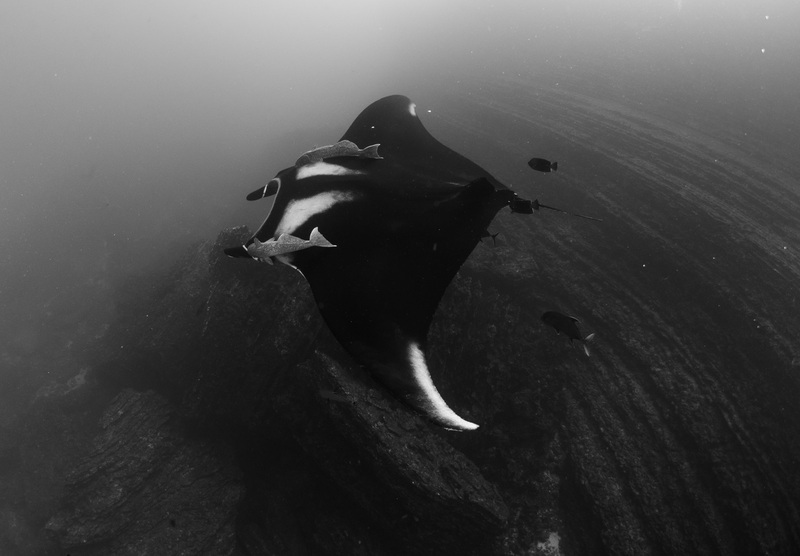 When Rodolfo swam to the other side of the rock at the Boiler, he was convinced that the same manta sought him out again to repeat the encounter. At times, we had four mantas circling. Our heads were on a constant swivel, quickly assessing which manta might come in close next – a great problem to have! Watching two of these massive creatures perform a graceful “ballet” – swimming upwards, touching bellies and somersaulting backwards was an incredible sight to behold. Not at all. Manta rays have neither stingers nor teeth. They are filter feeders that eat plankton (tiny organisms). They use the (cephalic) fins next to their mouths to funnel their food. Did you know that mantas have a unique fingerprint? The spots on their bellies (ventral surface) are a unique identifier. No two manta bellies are alike. 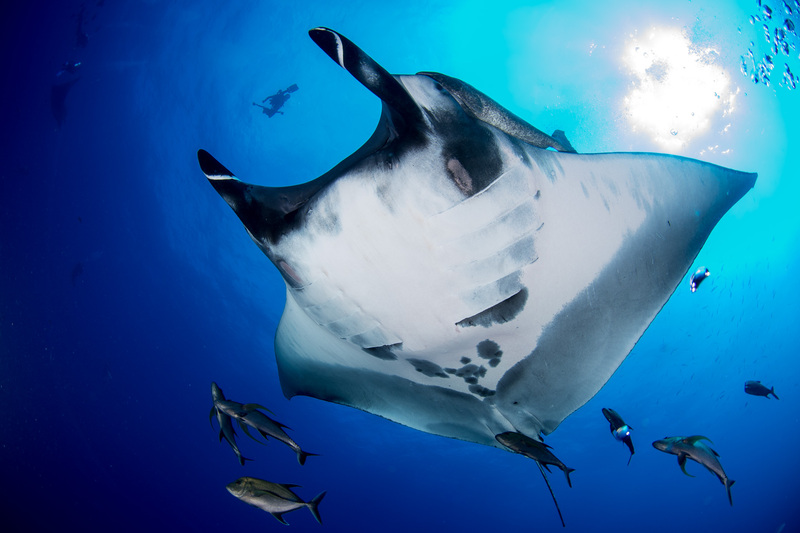 Scientists identify mantas with photos of their ventral surfaces. Interestingly, this was our first encounter with black mantas, known as “Black Morph.” These giant black mantas look like stealth bombers gliding through the water as both their backs (dorsal) and bellies (ventral) are primarily black. The black mantas are now definitely my favorite! While diving in Palau and Yap in Micronesia; Maldives; Komodo, Indonesia; and Mozambique, we’ve seen “Chevron Morph” mantas. These mantas have a white belly (ventral) with black spots and a black dorsal (back), with a white band running near the mantas’ head. 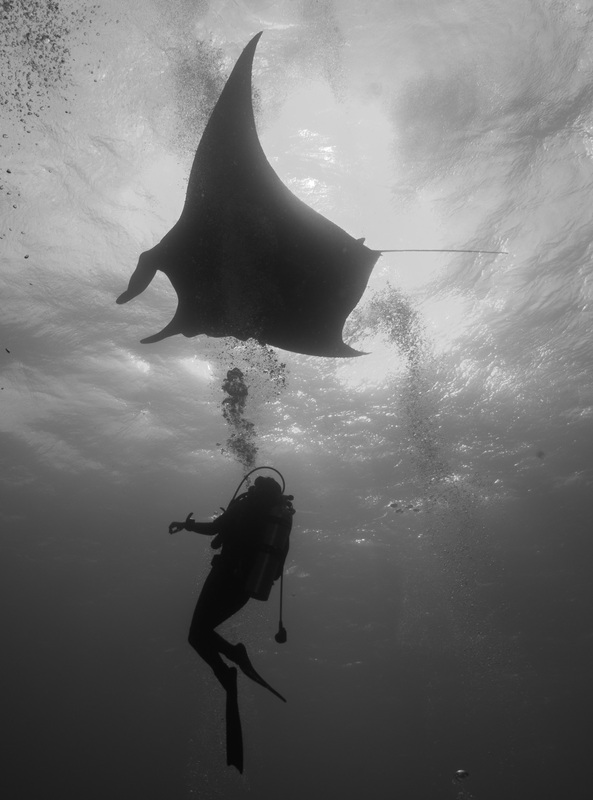 Most divers’ manta encounters tend to be with the smaller species. 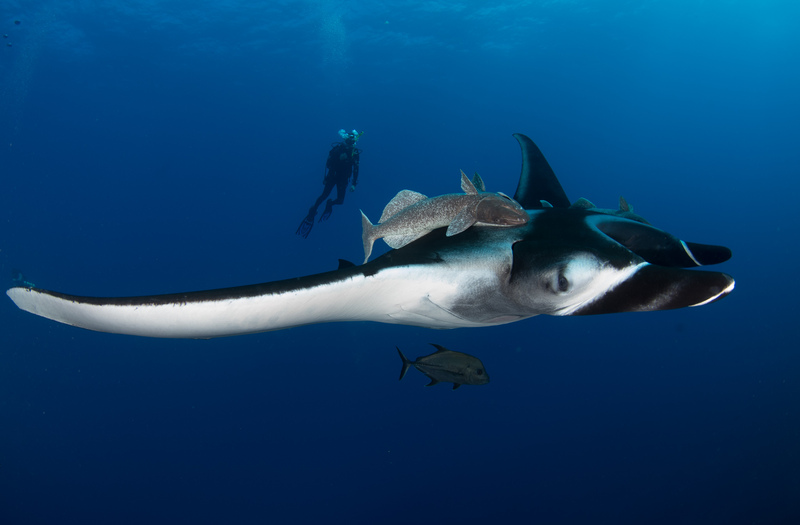 The size of the giant mantas in Socorro also results in the remoras (sucker fish) attached to them being huge – over two feet long! Elsewhere, they are only six inches. They move around and attach to different parts of the manta ray, removing parasites and dead skin. 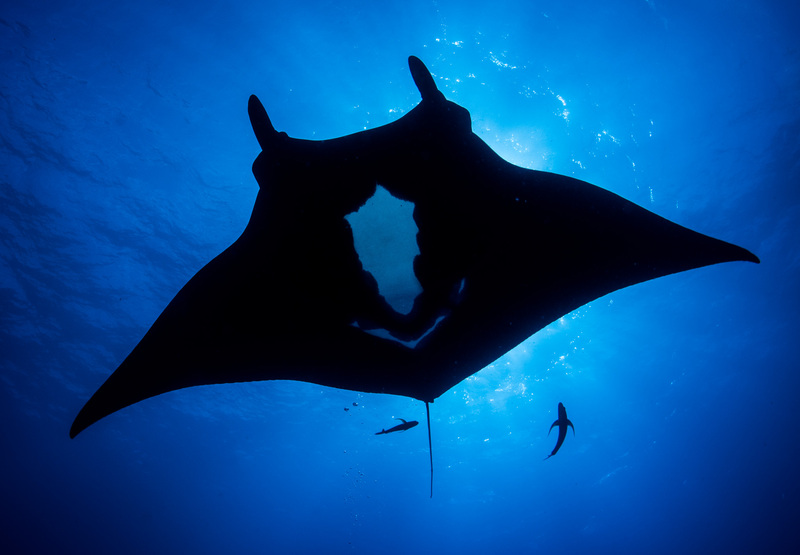 While not harmful to the mantas, they do leave a footprint-like pattern when they detach. Socorro’s moderate to strong currents are best suited for intermediate to advanced divers. To avoid hurricane season, diving trips to Socorro are offered November to June. 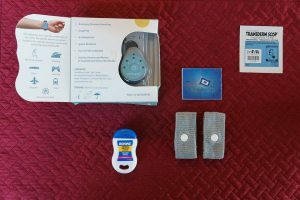 TIP: Come prepared with seasickness remedies for the 24+ hour ocean open crossing (Relief Band, Bonine, or Scopolamine patches). Relief Band is my go-to remedy since Bonine makes me drowsy (though less than Dramamine) and Scopolamine patches give me dry mouth and make me extremely thirsty. November-December: 75-80 water temps. 5mm wetsuit recommended. I also wore a Lavacore base layer for additional warmth. January-April: 70-74 water temps. 7mm wetsuit recommended. Since I find 7mm claustrophobic, I would wear a 5mm wetsuit + a 5/3 hooded vest + Lavacore base layer. 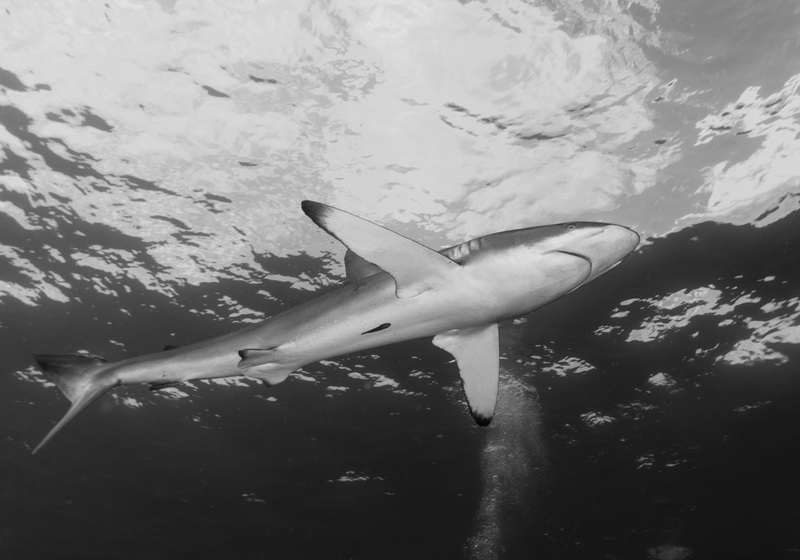 February-April: Best time for schooling hammerheads as they come up shallower with the colder waters. March-April: Best chance for humpback whale encounters. The captain shared one instance where a mom and calf were at the same dive site for 6 weeks. Divers could rest/nap during the surface intervals and be assured the playful mom/baby were awaiting their return. This type of prolonged whale interaction is uncommon. May – June: 75-80 water temps. The islands of the Revillagigedos: Roca Partida, San Benedicto, Socorro and Clarion. 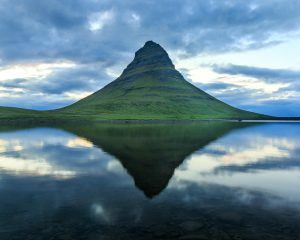 Interestingly, these islands are the peaks of extinct volcanoes that have risen above sea level. Fly into Cabo San Lucas, Mexico (SJD) and then board a live-aboard dive boat for your amazing adventure. Most Socorro dive trips typically last one week. We dove with, and highly recommend, Nautilus Explorer. They have top-notch boats, staff, and safety standards. People often ask us “aren’t you afraid to dive with sharks?” Unfortunately, the movie Jaws resulted in significant misperceptions about sharks. Did you know there is only a one in 11.5 million chance of being attacked by a shark? Worldwide there are only 65 shark attacks per year. Lightning is 30 times more likely to kill you. Take solace in the fact that a dog attack, snake bite or vending machine are more likely death mongers than sharks. Sharks aren’t the man-eaters they’ve been made out to be; they are typically skittish and keep their distance. Consider this next time you are in the ocean. After passing on an opportunity to see hammerheads in the Straits of Tiran in Egypt in 1996, I’d been waiting 20 years to see one. Being a newly certified diver with only five dives under my belt at the time, the thought of diving with sharks scared the beejezus out of me. 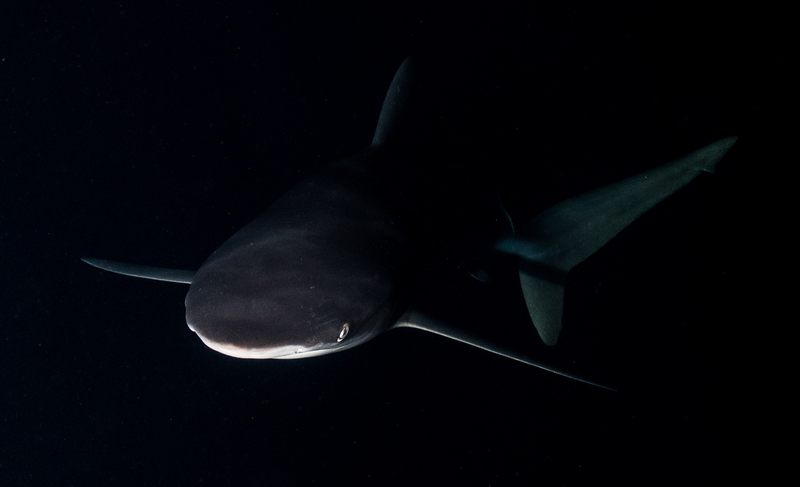 In Socorro, I saw THREE hammerheads – one of which was super close. My husband, Jason, saw a massive 15-20 foot great hammerhead in the distance. Sadly, we didn’t get any good pictures as they tend to be shy and stay deeper. We look forward to returning to dive Socorro in March next time in hopes of seeing schooling hammerheads and possibly humpback whales and calves. We’ll combine it with a trip to La Paz to snorkel with whale sharks. These sharks love to hang out under the boat at certain dive sites, allowing us to capture some nice pictures. 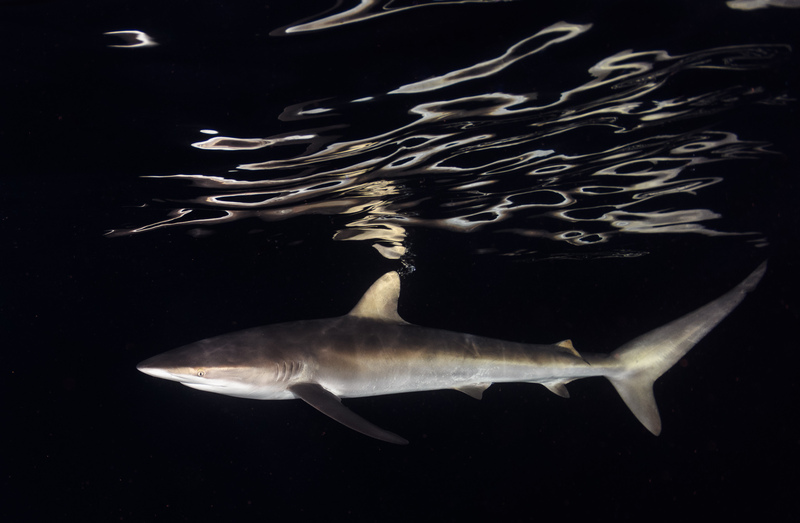 Nautilus also offers the opportunity for guests to do a night snorkel with the silky sharks. Since I long ago determined I’m not a huge fan of night dives/snorkels, due to lack of visibility, Jason indulged in this activity and captured some great pictures. Hi Marielena, what gear do you use for your underwater photography? Your photos are amazing! Thanks so much Amanda.I love your pilot avatar. 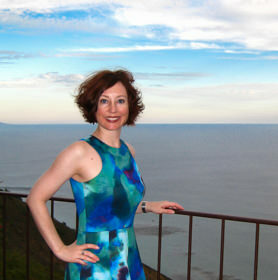 I’m so glad you enjoyed the blog and photos. Socorro was truly one of the most incredible wildlife experiences we’ve ever had. We are currently using a Nikon D500 in a housing + 2 strobes for our underwater photography. We previously shot with a Sony Nex-5 underwater. Both take wonderful images. We also use a GoPro to shoot underwater video (the videos from the Palau post were shot on GoPro). Now, we just need to improve our video editing skills for both the GoPro and drone. Stay tuned for underwater and aerial images of the Humpbacks in Tonga soon!